When you have a shared universe, one of the biggest benefits is the crossover–bringing characters from one show within the property over to another show. Agents of SHIELD is starting off its second season tomorrow with a crossover of sorts, featuring flashbacks with Agent Peggy Carter before her own spinoff starts early next year. While this situation is a little different, as both Agents of SHIELD and Agent Carter are spinning off from the same parent property, they still have enough in common to enjoy the benefits of a crossover. And with that in mind, I thought it would be a good time to examine the crossover and how it helps with the cohesiveness and plausibility of a shared universe. So, TV crossovers have a bit of an odd history. Since TV shows are usually produced by different companies, the rights issues get a lot more complicated. Early on, most crossovers were facilitated by the networks on which these shows aired, often between shows that otherwise had almost nothing in common (there’s a particularly interesting case of this involving Star Trek which I’ll elaborate on further on Friday). For something like a sitcom or procedural that’s heavily grounded in reality, this isn’t much of a problem. But when it starts to involve sci-fi properties with wildly different universes, continuity conflicts crop up almost immediately. As fan groups started to emerge and the idea of canon became more prevalent, these kinds of crossovers died out in most genre shows by the early 90’s. But with franchises forming through the creation of spinoffs, there was an opportunity for a new type of crossover, one that wouldn’t require messy continuity slip-ups. Since a spinoff is, almost by definition, in the same continuity, it’s much easier to have characters move from one show to the other without causing significant problems. Take Star Trek, for example, particularly The Next Generation and its first spinoff Deep Space 9. TNG set up certain events, like the war with the Cardassians and their associations with Bajor, within its own show, but was allowed to continue playing with these concepts well after DS9 began. 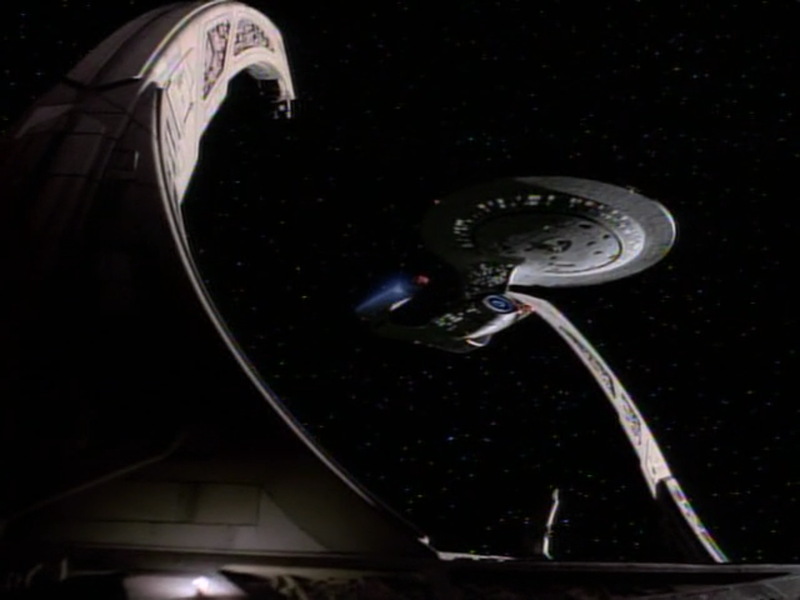 The Enterprise visited Deep Space 9 on a few occasions, in search of information or as part of a mission. Heck, Chief O’Brien actually jumps shows and becomes a regular on DS9, carrying a lot of his preexisting character arcs with him. Better still would be the Maquis plot, which was developed on TNG as a way of setting up the premise of Voyager, but once that show began, DS9 was allowed to continue the plot, arguably doing more with the inherent moral ambiguity of the situation than Voyager ever did. Teal’c and Ronon didn’t like each other much at first, which made the eventual team up all the more enjoyable. Why bother with crossovers, though? Why not just spinoff the new show and leave it alone after that? It happens; the “Poorly Disguised Pilot” didn’t come out of nowhere. But having a spinoff set in the same universe as the parent show offers so many benefits that it would be foolish to not take advantage of them. First among these is, obviously, cross-promotion. By having characters from the parent show appear in the spinoff, or vice versa, it can help to boost the ratings of the hosting show by bringing in members of the guest show’s fanbase who may not regularly follow the host show. 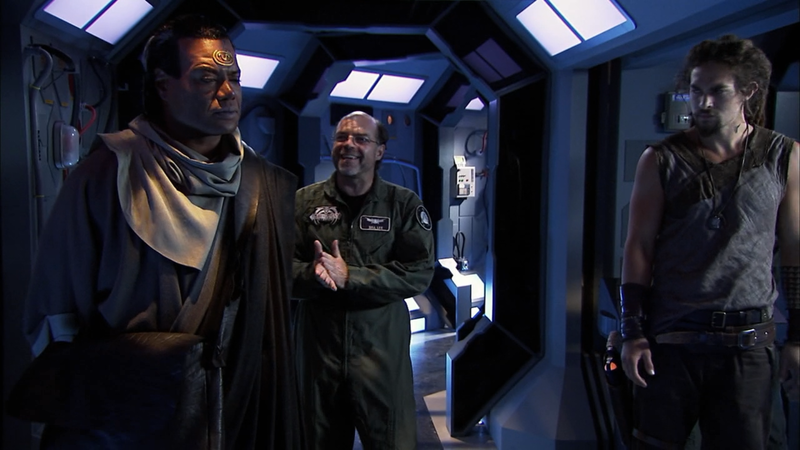 Take the Stargate Atlantis episode “Midway,” which featured Teal’c from Stargate SG-1 teaming up with resident tough guy Ronon Dex to retake the Midway space station. Teal’c was a popular character, and SG-1 had already ended its run and moved on to direct-to-video films, so his appearance would easily draw in SG-1 fans who had previously not been watching Atlantis so that they could see him in action once more. A more extreme example of this is when a character crosses over from one show (usually the parent program) to another for good. Worf did this by moving from TNG to DS9, as did Samantha Carter from SG-1 to Atlantis. In both cases, the parent show had ended, but the characters were popular enough that bringing them over to the spinoff was deemed a potentially profitable move. In Carter’s case, there was a real world element to it, as Amanda Tapping had a contract from her time on SG-1 with one season still left on it. Rather than break the contract, her character was moved over to Atlantis to replace the outgoing character of Dr. Weir. There are other budgetary reasons that sometimes crop up, such as being able to utilize sets created for one show on both (see TNG’s frequent usage of runabouts post-DS9). Being able to spread out costs between the two shows helps to give the writers on both more options and more standing sets available to utilize. Carter moved over to Atlantis after the end of SG-1, and fit surprisingly well. From a fan perspective, the most important use of a crossover is to increase the verisimilitude of the universe in which the shows take place. When you have these two (or more, occasionally) shows going at the same time, and big events happening in both, it often becomes a problem of “Why don’t they just call the other show’s cast for help?” This is one of the big things Agents of SHIELD wanted to avoid, having people ask what Captain America or Thor were up to while SHIELD was busy. There’s usually a pretty good reason as to why built in to the show; SHIELD operates on a secretive basis, and there are a lot of things even the Avengers aren’t allowed to know about, so situations rarely get dire enough to necessitate breaking that rule. Trek shows had vast interstellar distances between them which prevented most crossovers, especially once it was down to just Voyager and DS9, with the two about 50,000 lightyears apart most of the time. Same thing with SG-1 and Atlantis, and later (to an almost ludicrous extent), Universe. But with such big distances keeping them apart, how do you still make it clear that these shows exist in the same time and space? One way is to bring over minor characters or plot arcs. Stargate was the king of this–Rodney McKay was originally a minor character from a few episodes of SG-1 and wasn’t intended to be part of Atlantis, until David Hewlett blew the audition out of the water. Season 5 mission commander Richard Woolsey also got his start as a minor bureaucrat in SG-1 before becoming a main character. In all, there were 8 characters who managed to appear in all 3 Stargate series, ranging from big names like McKay and Carter to fairly small characters like Harriman, the gate technician. Often times, this is a big thing, but it doesn’t have to be; in the aforementioned “Midway,” there’s another character, Bill Lee, who had a spotlight episode in SG-1 and appeared a handful of other times. It’s not made to be a big deal that he’s present. It’s just a neat reference which helps to reinforce the idea that these two shows take place in the same universe. Sometimes it’s even less than this, like Dr. Crusher calling up the Enterprise-E’s Emergency Medical Hologram to use as a distraction for the Borg in First Contact. It’s a recognizable in-joke for Voyager fans, but it also completely makes sense for the Enterprise to have an identical EMH. 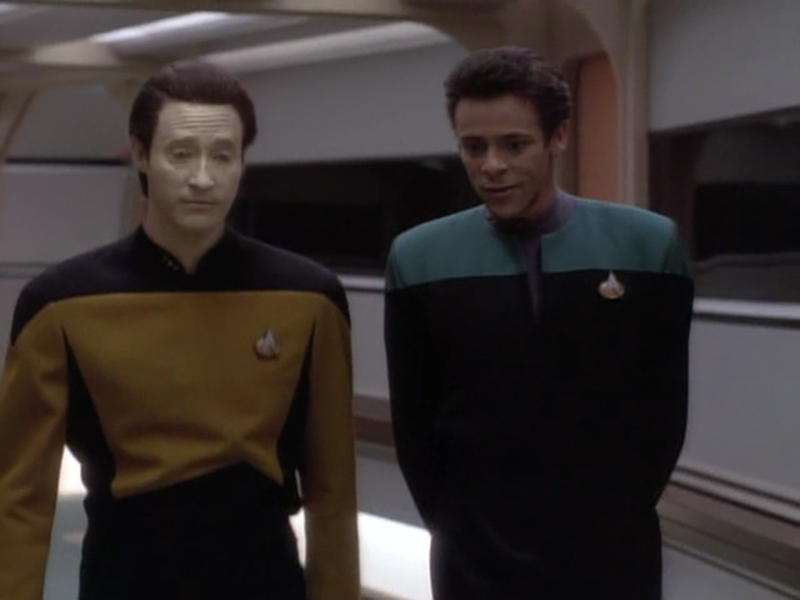 The EMH subplot even ended up having a big effect on DS9, as it’s during the attempt to create an EMH mark II based on Dr. Bashir that the truth of his genetically engineered nature emerges. 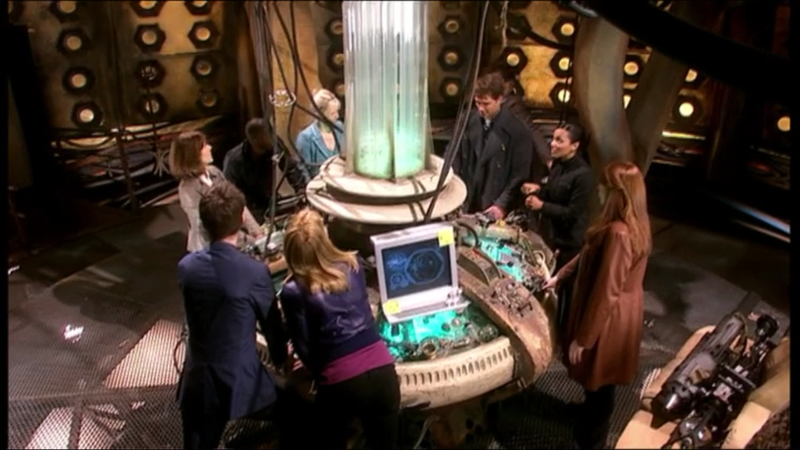 Rose, Jackie, Mickey, Martha, Donna, Sarah Jane, Captain Jack, and the Doctor? That’s gonna be a hard one to top. Another alternative is the big event crossover. When you have two or more shows running concurrently, one of the options that presents itself is the possibility of setting up a plot that runs through all of them, some event that’s too big for the cast of just one show to deal with. The best example I have of this is Doctor Who series 4 finale “The Stolen Earth/Journey’s End,” which brought together characters from Torchwood and The Sarah Jane Adventures with the Doctor and many of his past companions to deal with Davros and save the Earth. This is always a HUGE deal–the consequences have to be absolutely monstrous to necessitate this kind of crossover, or else the audience starts wondering why they don’t do this kind of thing more often. “Stolen Earth/Journey’s End” also brought together plots from those shows, like the Doctor’s hand, which was seen throughout Torchwood and which Captain Jack had used to detect when the Doctor was nearby the season before. In keeping the hand safe, Jack incidentally provided the Doctor with an outlet through which he could redirect his regeneration energy, allowing him to remain the same and spawning the Metacrisis Doctor. By bringing all the good guys in the shared universe together, who each had been playing their own parts and starring in their own stories, it really lends an epic scale to the storyline that just would not be possible without the spinoffs. So as you can see, the crossover is an instrumental tool in the shared universe’s toolbox. It helps to bind the shows more tightly together and create a real sense that they all inhabit the same world. Be they small references or full character transplants or massive crossovers that cap off plots that multiple shows had been building up, crossovers make it clear that sometimes more really is better, provided the writers know how best to make use of the power they’ve been given.